On this page you will find useful information of the northernmost, southernmost, easternmost and westernmost points in Germany and their distances towards each other. The northernmost town in Germany is Flensburg, the southernmost German town is Sonthofen. The distance between these two towns is about 811 km (504 miles) as the crow flies. Sometimes Garmisch-Partenkirchen is mentioned as the southernmost city in Germany, but this is not correct, as Garmisch-Partenkirchen is officially not a town but a municipality. The distance between the northernmost inhabited location in Germany, List auf Sylt, and the southernmost inhabited place in Germany, Einödsbach, is about 857 km (533 miles) as the crow flies, and is thus the maximum distance in Germany's north-south direction. Show distances as the crow flies from Flensburg to Sonthofen | List, Sylt to Einödsbach in map. The maximum distance between two cities respectively towns in Germany in east-west direction is about 625 km (388 miles) as the crow flies between the easternmost town Görlitz and the westernmost city Aachen. The distance between the easternmost inhabited place in Germany, Neißeaue-Zentendorf, and the westernmost inhabited place in Germany, Isenbruch, is about 630 km (392 miles) as the crow flies and is thus the maximum distance of Germany into East-West direction. Show distances as the crow flies from Görlitz, Neiße to Aachen | Neißeaue to Isenbruch in map. 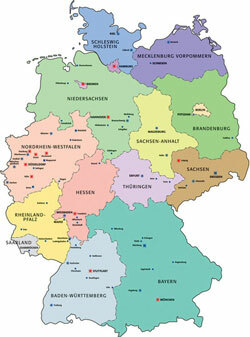 A larger map of the German federal states and the German state capitals can be found here.